An enthusiastic group gathered at St Luke’s Te Kuiti for the Waikato/Taranaki Mission Festival. The theme of the day was “Make Time for Missions” and HOPE (Helping Overseas Partners to be Effective). The purpose of the event was to support and inspire Parish Mission Motivators to learn more about the workings of Anglican Missions (AMB) and the associated agencies that support the overseas mission arm of the Anglican Church in Aotearoa, New Zealand, and Polynesia. It was also an opportunity to gather sharing ideas and networking with the various Parishes and Ministry Units wanting to be more effective in Overseas Mission support. Archbishop Philip Richardson greeted us and introduced us to the day’s programme followed by St Luke’s Parish who set the scene with Morning Prayer. The Festival kicked off with Reverend Mike Hawke (the Church Support Officer for AMB) sharing a scripture reading from Luke 4:16-30 where Jesus delivers the first sermon on Overseas Mission. Mike then outlined the role of AMB and the places where most of the support we raise is used effectively. Papua New Guinea is currently under resourced and Mike is spending a great deal of time and energy visiting, networking, and evangelising to locals. Mike has also been busy in Samoa where there are a limited number of Anglican churches but where Mission funds for preschools and education have been most appreciated. The new AMB booklet Inspire: a guide to mission focussed motivating is a great resource for use in a Parish setting. Mike is the best Mission Motivator the Anglican Church has because of his enthusiasm and passion for spreading the word about Mission support. Bryan Carey spoke on Short Term Mission Trips and the necessary requirements for planning, funding, preparations and departures on a short term mission trip. Rosemary Carey spoke on how parishes and individuals can support mission trips by being at home. Rosemary spoke about supporting others to go and how NZCMS (New Zealand Church Missionary Society) partners can be encouraged. We then met in small groups to share and discuss ideas for motivating others and ways of making time for Mission within our different settings. Paul Cooper the National Chairman of NZCMS spoke about the partnership between NZCMS and AMB and how each complements the other. NZCMS can offer a range of opportunities for Mission outreach locally and overseas for a range of ages, types and style of mission. As with most events there were questions to be asked and a panel of Archbishop Philip, Mike Hawke and Paul Cooper, answered a range of questions ranging from tax relief for mission giving to checking the importance and sustainability of mission funding in many of the island nations. At the conclusion of the Festival, in a poignant sacred space, Archbishop Philip anointed and commissioned the Mission Motivators present to go back home and spread the message of partnership. That is the partnership between individual parishes and AMB/NZCMS and one another. 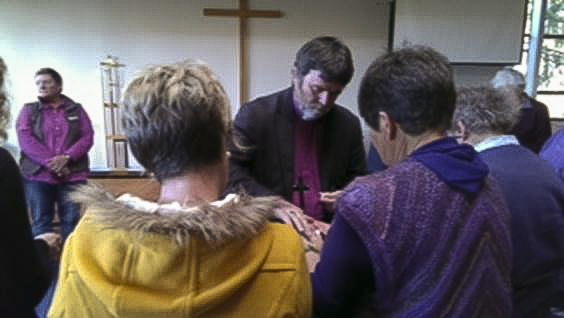 Everybody felt the day had been a success but realised this was only a starting point to much work which lies ahead for the Waikato/ Taranaki Anglican Diocese if it is to reach the declared monetary target figures set for 2013. The focus of overseas mission needs to be on every parish agenda and the role of the Mission Motivators within each Parish is crucial to the success of awareness and fund raising efforts.